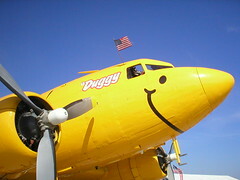 I'm hitting the road soon, after a great week at AirVenture. I have a few more pics which I'll post when I get home. I had a lot of fun collecting the stories and pics all week. Hope you enjoyed them. I wrote this last year, and now Phil added something. They’ve watched the EAA grow up all these years. It was a little different back when. "We knew everybody staying in Rockford," says Fred. "I took the president of this operation and helped him over a fence once. His sister, she was big enough, she could get over the fence. But he couldn’t. How many people can say they boosted the president over a fence?" Biggest storm of the week swept through this morning. Around 7:30am the sky darkened like it was nighttime. Then the rain started. Heavy wind and rain for about a half-hour. It's been showering and overcast since then. The forecast is for more rain, then getting very hot again. Mid to high 90s. This is a weird day for me here at AirVenture. All the newspaper work is done. The final issue is out. The staff will be in and out throughout the day, cleaning up, and just decompressing. I'll spend much of the day catching up on things I haven't seen yet, and shopping. I should have a bunch of pics to post later. Tonight is the big EAA cast party. I've never attended before. I'm looking forward to it. I hit the road tomorrow to return home. It's not as hot as yesterday, which is strange since the forcast was for it to be hotter. A couple lines of t-storms drifted through earlier this morning. None hit us, but I could have taken more of those scary cloud pics. We're working on the final paper for the week here at AirVenture Today. Bitter-sweet. We're glad to be done, but a little sad that the week is ending. It's a great team, we all enjoy each other's company. I did some regular-old-wandering-like-a-real-attendee stuff this afternoon. Saw some interesting planes. Diamond has come a long way from the original Katana that we drooled about so back at the West ValleyFlying Club. They have a whole line of planes now. 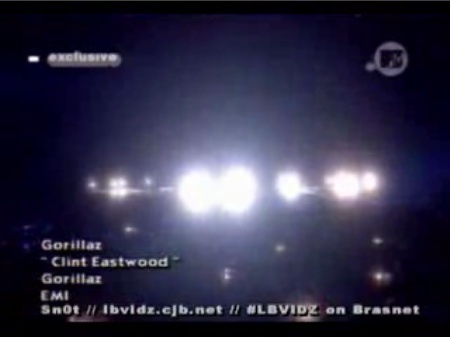 And the intro'd a light jet. The D-Jet. Maybe I need to learn something about jet engines. They seem to be the way of the future. Today is the biggest airshow of the week. Yesterday's was big too. I was over at the Super8 at the end when they set off all the Pyro. It even shook the windows way over there too. Tonight's the big AV Today staff dinner. Always fun. It’s much quieter along the flightline in the first hour after sunrise. The other early-risers are walking on the dew-covered grass, admiring the airplanes, searching for coffee. The donuts at the Classic Cafe are still warm. 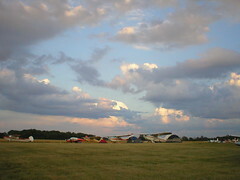 At the ultralight strip, the powered parachutes are launching, circling the fields in the morning light. I should get out early more often. "IFR and VFR are totally different," she explained. "You take a lot of things for granted when you’re filing IFR. They tell you who you’re supposed to talk to. VFR there’s a lot of flipping through pages to figure out what’s the approach." She started to sound a little frantic. "I don’t have my taxi diagram, oh my gosh, where’s the yaw damper? Why doesn’t a Taylorcraft have a yaw damper?" The big thing so far today was a brief appearance by the Navy jet performance team The Blue Angels. 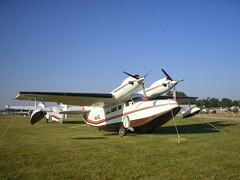 Apparently they've never appeared before, as a group, at AirVenture. So it was cool that they did. But it was also a little disappointing that they only did three, five ship, formation passes, then left. Things are starting to wind down. A lot of the early arriver airplanes have started to leave. There are many empty spaces in the airplane parking now. Three days ago it was all full. Today, tomorrow and sunday are usually the biggest crowds of the week. But a lot of that is the "civilian" attendees who want to see the show, but aren't really aviation people. This morning, the local daily paper, The Northwestern, had a piece about the paper I write for when I'm out here. With a staff of 15 and a deadline of 5 p.m. EAA's AirVenture Today newsroom functions similar to any other  it's busy. Except the newsies that make up the newsroom have an added element of chaos. Reporters, editors, photographers and copy editors come together from all parts of the United States to make the EAA daily newspaper happen. Seven reporters and two photographers are responsible for all the stories and photos that fill the daily 40 page publication. "This is all my fault," she explains. "Years and years ago, I wanted to get him something unique for Christmas, so I went down to my little airport and got one of those demo flight certificates. So now, a pilot certificate and an airplane later..."
"It just keeps on escalating," he laughs. After getting that gift, Dave jumped in with both feet. He learned how to fly after that Christmas, and came to Oshkosh that next summer. He hasnt missed a year since, and now hes thinking of building an RV-10. "He gets ties for Christmas now. All thats gonna do is cost me a new suit." 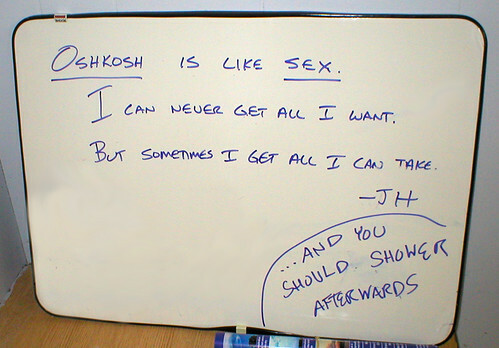 We're having a great time here in Oshkosh. The crowds seem to be pretty big. This is only the second year where the event began on Monday, so it's hard to compare one year to the previous, but it feels pretty busy. The big thing we're looking forward to today is the flyby of a pair of F-22 Raptor fighters. These are the new, next-generation super-fighters that have only recently gone into service. They are apparently not stopping here, just doing a flyby. So we're all watching the clock to be out on the flightline at the appointed time. Last night I spent the evening cruising the convention grounds. I watched the Ultralights for awhile. I drove my little scooter all the way down south the the most distant row of airplane parking -- Row 147 this year. I talked with a woman who bought her airplane on eBay. Later I headed out for dinner at "Ardy & Eds", an Oshkosh favorite. 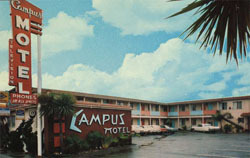 A&Es is a 50s style car-hop, complete with waitresses on roller-skates. Good, junky food, and scenic. I've been doing more writing for the paper this year than in the past. I like it. I did a straight news piece on the Cirrus press conference, and for tomorrow's paper a thing on a guy trying to fly a Piper Cub around the world, and another on the Smithsonian Air and Space Museum. Keeping busy. I also have a bunch more pics to post. I'll get to them as soon as possible. I just got rained on for the first time of the week. A brief but heavy rain squall passed through. My friend Randy pointed out to me a free source of ice cream bars for accredited members of the press. That's me. Bad. 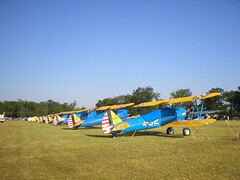 As I walked onto the field this morning, I experienced a classic AirVenture moment. Overhead, a pair of P-51s were making the right break to Runway 27. A DC-3 was just lifting off at the near end of the runway, and a B-25 was landing at the far end. In the distance, a half-dozen planes were on downwind to base to final for Runway 18. I also wrote a regular feature story today. It's about the builder judging process. Bryan Stearns are you there? We now resume regular programming. Each year about this time, everything aviation blossoms in our small community here at Wittman Field. A half-dozen boys are throwing around a football on the North 40 taxiway. A really big brat grill is servicing the Cessna pilots at the west end. Folding chairs, sun umbrellas, cameras, radios, bikes, and aviation fans gather along the fence, watching the planes land. A twin does a fine job S-turning, to stay behind slower traffic, and gets a big round of applause as it comes over the numbers. 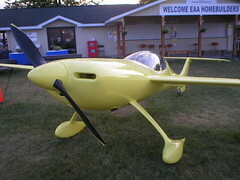 Here's an EAA pic of the new Cessna Light Sport Aircraft. And look! The bright yellow shirt in the lower right corner of the pic. That's me! 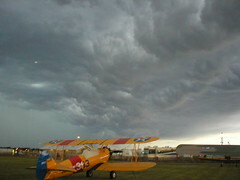 Here are more pics from AirVenture 2006.
and, not your typical father-son flying story. Its Sunday, and a steady stream of planes are arriving in the North 40, filling up row after row. Lots of different colors, sizes, and shapes. The EAA flag people wave their orange wands, directing newcomers to the next open space. Fuel trucks bounce up and down the rows, topping off tanks. Tents, sleeping bags, and all kinds of gear are being pulled out of loaded-to-the-limits small airplanes. 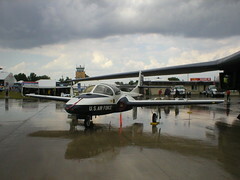 AirVenture 2006 is under way. The big story today is Cessna revealing their new Light Sport concept aircraft. Cessna entering this new field will add even more credibility to the exciting LSA area. 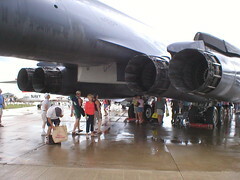 There was a big crowd around the plane, which they had covered with a black cloth until the moment of the announcement. I'll go back later, when things have thinned out, and get some pics to post here. Cessna also teased the crowd by having a suprise fly-by of a new, also concept, plane that will apparently compete in the 4-6 place, piston market. That plane is so new that they aren't gonna have it on the ground here. The fly-bys were we got. Here's the first of my daily columns which are appearing in AirVenture Today, the EAA show daily newspaper. It’s still pretty quiet, Friday afternoon, in the first half-dozen rows of the North 40 airplane camping area. The first few rows are filled in, and the choice spots on the next few rows, closest to Runway 9/27, are taken. The trickle of incoming airplanes, landing on Runway 9, is punctuated by a Learjet arrival and the takeoff of the bright red Oracle biplane. A comfortable breeze has cooled things off today, and these early arrivers are sitting by their planes, renewing acquaintances, and watching the runway. I posted some Osh pics here. Today is what I call DayZero at the fly-in. The event officially opens tomorrow, but for years now many people have arrived on this day before, 'cause there's already plenty going on. Many of the exhibits are up and running, there are plenty of showplanes to see, and there's even food to be had. So there are a lot of people here this morning. We've had a little bit of difficulty getting on the internet. That's why my postings have been scarce. Hopefully it's fixed now and the fun will begin. I arrived safely in Oshkosh this morning. We are still three days away from the start of the event, but the place is very busy with prep. I interviewed some of the early arrivers for my first column. And I got to wander around the grounds a little bit. One notable change is a huge new exhibit tent, right across from the FAA building, which is for Honda. It appears that they will, maybe, be displaying their new "HondaJet" in there. Pics as soon as it happens. EAA has posted on its website some early pics of the preparation for this year's convention. I'm hitting the road soon, and will be arriving in OSH on Friday. This is an amazing example of the power of citizen reporting in this new internet age. Cruise Critic website is publishing first person reports which were emailed to it from people onboard the disabled cruise ship. It sounds like it was a pretty terrifying situation. This was probably the scariest moment I have ever experienced. The water came up to the Promenade Deck and actually almost hit the lifeboats. We have heard that the rear and port side of the ship were fairly well in the air. "The stairwells turned into waterfalls. The gift shops and casino turned into glass and chip graveyards. "The dining room right now is full of injured people and passenger doctors and nurses are doing whatever they can to help. Here's the AP story about the incident. Sunday in the Park recreated. "Beloiters brought to life the famous painting by the French artist Saturday afternoon in an effort to promote an August event planned by Friends of Riverfront. 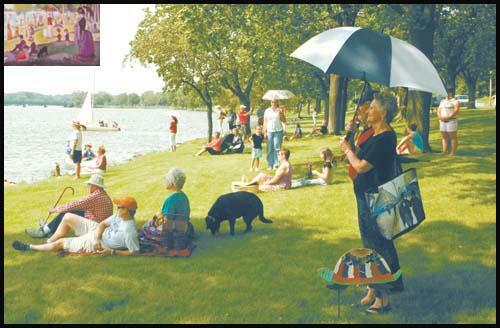 And while people were positioned similarly along the Rock River, Beloit's version of Seurat's work had its own flair." Here's another terrific, brief, talk from the 2006 TED conference. Sir Ken Robinson believes that education systems worldwide are profoundly broken in that they devalue, and even discourage, creativity. The universities designed the [current education] system in their image. If you think of it, the whole system of public education around the world is a protracted system of university entrance. And the consequence is that many highly talented, brilliant, creative people think they're not. Because everything they were good at at school wasn't valued, or was actually stigmatized. And I think we can't afford to go on like that. On Monday night of AirVenture 2006 the Beach Boys will put on a concert in AeroShell Square, aka the West Ramp/Showcase taxiway. I leave in a week for my annual pilgrimage to Airventure Oshkosh, the biggest aviation gathering in the US, maybe the world. Like in past years I'll be blogging the event. Posting stories here, photos on flickr, and new this year, video reports too. And I'll be writing my daily column 'Around the Field' in the show daily newspaper 'Airventure Today'. It's a little hard to tell from his website, but it appears that the "trade a red paperclip for a house" guy has succeeded. I am intelligent, witty, a bit geeky and have great power and responsibility. Peter Scheer, in an article in Slate, has proposed an alternative way for the media to protect sources, given the Administration's antipathy to a free press. But journalists have been so mired in the debate about the First Amendment protections they lack, that they have overlooked the protections the rest of the Constitution might afford. Because if the First Amendment can no longer be counted upon to keep reporters out of jail, invoking the Fifth Amendment privilege—refusing to disclose the name of a confidential source because doing so could be self-incriminating—may well succeed in protecting both the source and the reporter. 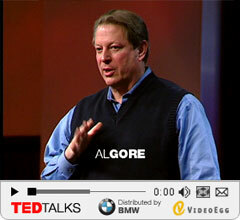 You have to check out this video of Gore's talk last January in Monterey, if only to see a really different Al Gore in the first five minutes. This guy came "this close" to being President. How different things would be if he had prevailed.